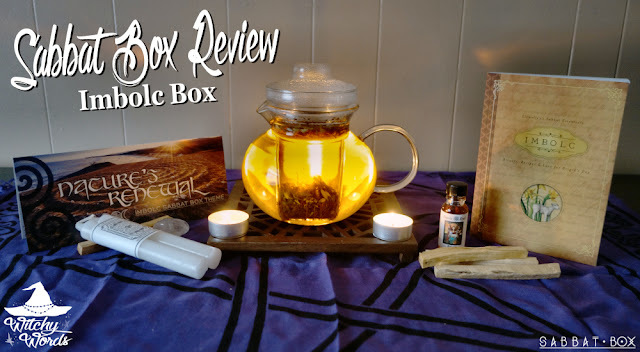 You know what time it is: Sabbat Box review time! If you haven't followed my posts or seen Sabbat Box before, then today's your lucky day. Sabbat Box is similar to the Loot Crate concept, only for pagans and witches! Each box contains a selection of items useful to each specific sabbat and garnered from small businesses which your money supports. The box's value exceeds the price you pay always, so you can also feel great as your investments double as a bargain. Sabbat Box is pagan goodies delivered straight to your door! So let's see what's inside, shall we? As always, the first thing you'll see when you open the box is the trifold brochure. This little guy is packed full of details about the items you'll see inside the box and how to use them, as well as correspondences and details about the sabbat itself. It even includes some reference blogs and podcasts on the back! Definitely worthwhile to take a look at. The box begins with a pack of palo santo wood provided by Sun's Eye. If you've never worked with palo santo before, you're in for a treat. With a name meaning "holy wood," this fragrant tree is of the same lineage as frankincense and myrrh, and its strong aroma is hinted with a certain citrus and smokiness that you really only think of when you think of palo santo. Use it like an incense to cleanse and heal your spiritual self - perfect for the renewal holiday! If you'd like a description of how to use palo santo, the Sabbat Box blog has a fantastic description here. And if you'd like to pick some up, you can purchase it in the Sabbat Box store. These beautiful white tapers are a Sabbat Box exclusive item and perfect for purification during Imbolc. White itself represents a clean slate, if you will, giving you a fresh start during this holiday. You might choose to use these candles as a primary ritual candle or as a personal spell candle. You could carve words, sigils or runes into the candle and even dress it with herbs or oil! To get your own pair of candles, click here! Speaking of oil, this holiday's Sabbat Box also includes a vial of Brigid oil by Sun's Eye. Imbolc itself is a Celtic holiday closely tied with the deity Brigid, the goddess of fire and the patroness of poetry, creativity, the arts and medicine. This oil could be the perfect thing to dress your candles with (remember - dress outwards to repel and inwards to draw to you), or you could use it for other ritual means, including burning it in an oil burner for incense. To get your own vial of Brigid oil, click here! This piece of quartz, sourced from Azure Green, is a great do-anything tool for your ritual. While clear quartz is great for purification and protection, which makes it a fantastic addition for Imbolc, it also strengthens magickal work and other stones around it. The quartz also includes a small card explaining its correspondences. To get your own quartz piece, click here! As always, each Sabbat Box includes the corresponding holiday's Llewllyn Sabbat Series book. This one, written by Carl F. Neal, includes all sorts of correspondences and activities for Imbolc. As I've said before, this is a fantastic resource for the new witch or pagan who's just starting to celebrate the Wheel of the Year. This makes it a fantastic addition to the box. Get your copy of Lewellyn's Imbolc book here! One of the largest items of the box is this gorgeous altar cloth by Eclectic Artisans. This cloth comes in five different styles and adds a touch of color to your altar. What a fantastic way to get you started on an altar should you not have one or to add to an already existing one! Click here to purchase your own! 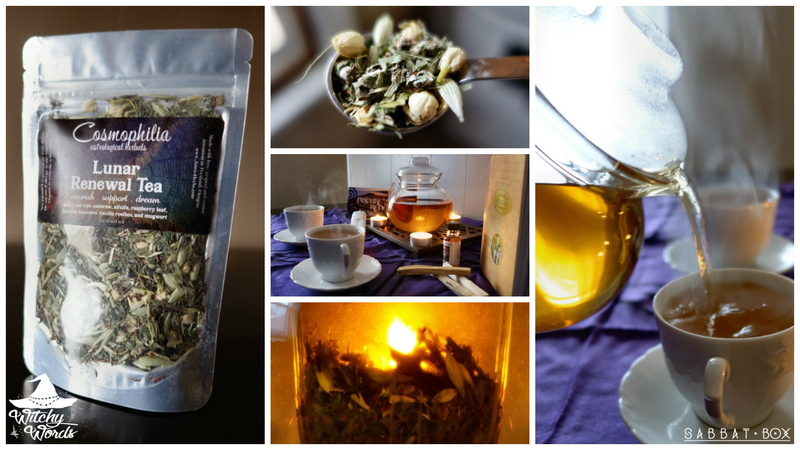 But I've been saving my favorite part for last: This wonderful Lunar Renewal Tea by Cosmophilia Astrological Herbs. If you've read Witchy Words for even just a few minutes, I'm sure you already know how much of a tea lover I am. I have an immense teapot and cup collection and have reviewed a multitude of teas in the past. So, of course, once I saw this pouch, I had to break out my nifty clear teapot and make me a pot! Cosmophilia was founded by Jaysen Paulson (JayP) in Portland, Oregon, and specializes in organic, wild-grown herbal ingredients. 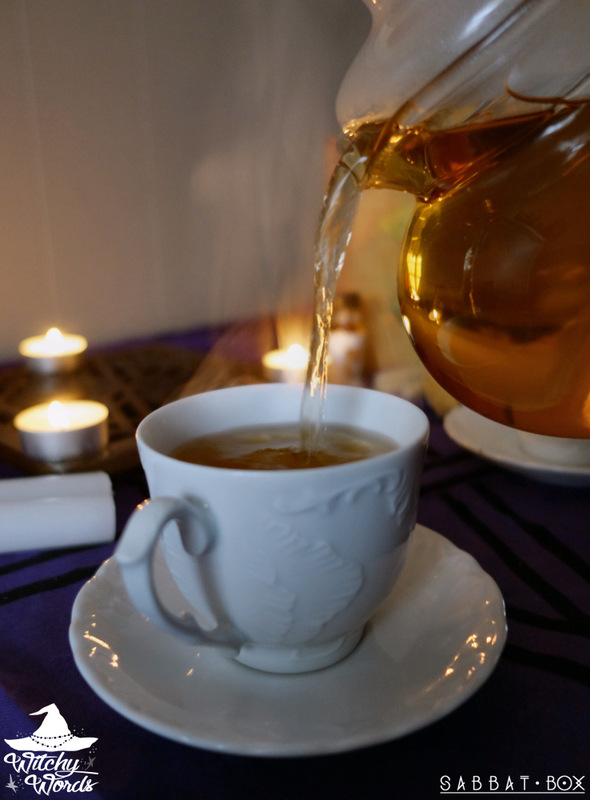 A teacher at the Portland School of Astrology who runs a fantastic podcast also called Cosmophilia, JayP has an extensive history in astrology and herbalism, so this tea is sure to delight. Containing milky oat tops, oatstraw, alfalfa, raspberry leaf and mugwort, the star of this tea is the vanilla rooibos, which adds an earthy sweetness, and the jasmine blossoms, which give the tea a light floral taste. This tea isn't meant to smack you in the face with taste - instead, it gently dances across your taste buds. Use the tea as a pre-ritual activity, a toast during ritual, or for spell work surrounding Imbolc. To get your own resealable bag of Lunar Renewal, click here! And there you have the Imbolc Sabbat Box! If you'd like to join the Sabbat Box waiting list for subscriptions, click here! Sabbat Box creators are working their rears off in hopes of being able to offer even more subscriptions but, until that time comes, you can always purchase the items found in each box at the Sabbat Box store located here - no subscription necessary! Another well thought out Sabbat Box and a thoughtful review as usual. Looking forward to when I can subscribe! Thank you so much! I'm not sure how soon subscriptions will be officially open, but I do know it's incredibly important and they've been working hard on it!